It's a great time to be a fan of the Resident Evil series. Revelations, Operation Raccoon City and the upcoming Resident Evil 6 are all released this year, so a Resident Evil fan should be in heaven right about now. And believe me, I am! Along with the new games listed above is a compilation of both Wii RE: Chronicles games entitled Resident Evil Chronicles HD Collection. This on-rails shooter collection is exclusive to the PS Store and includes Umbrella Chronicles and Darkside Chronicles for the asking price of $26.99. Both titles are presented in widescreen with a 1080p presentation. They both have redone HD graphics and look a lot better than they did on Wii. Wii has more of a foggy appearance even at its highest display setting but Chronicles HD is crystal clear. A leaderboard has now been added to Umbrella Chronicles so now both games have a leaderboard for posting scores. Both games carry their own trophy set as well. The games still have a local coop option with the use of a second controller or Move. Both games are fully playable with a PS3 controller or a PS Move. 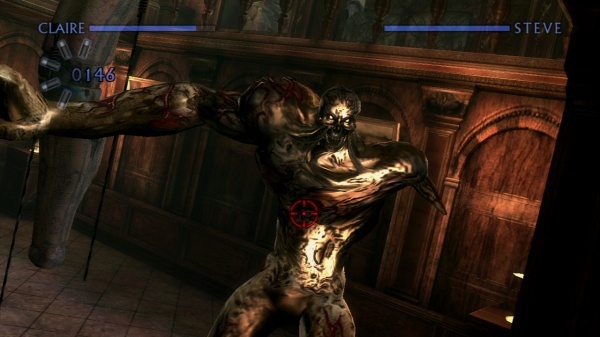 Umbrella Chronicles summarizes the events that took place in Resident Evil Zero, 1 and 3. It adds side story scenarios that help to explain some of the story that was never told in the main games. Umbrella also has a fourth scenario that shows how the Umbrella Corporation was brought down with the help of Chris and Jill. Each scenario has around 2-3 shooter stages to play through. Umbrella Chronicles has a lot to offer with its many hidden scenarios and it's overall easy to play. The game allows a player to upgrade weapons and there are many collectible files spread across its stages. It encourages players to destroy everything in the environment to check for hidden pickups and files. 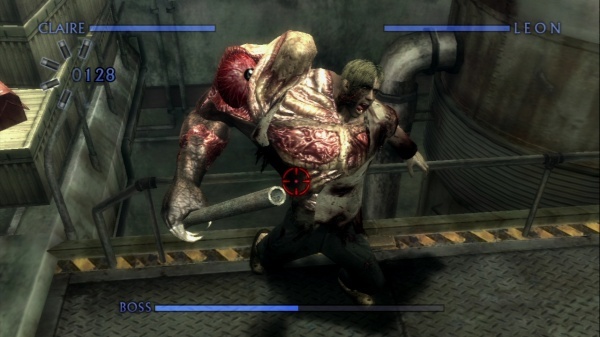 The game requires a player to perform certain objectives such as destroy a certain number of environmental objects or shoot a certain number of zombies directly in the forehead for a headshot in order to finish a stage with an S-rank. With a normal PS3 controller, this gets very hard to do. Umbrella basically requires a Move controller for full enjoyment of the game. Progressing through the story isn't that much of a problem with a PS3 controller so long as I upgraded my weapons however for the steep difficulty curve around Mansion Incident 3 in the scenarios list. Darkside Chronicles introduces a new scenario known as "Operation Javier" that takes place before Resident Evil 4. This scenario has Leon and Krauser in it and gives them both some extra backstory leading up to the events of Resident Evil 4. Darkside is much more creative in its storytelling with how it reflects on the events of Resident Evil 2 and Code Veronica X scenarios while telling the new scenario of Operation Javier. Even the menu selection is creative in its shards of glass presentation, sort of like fragmented memories. Even with only three main scenarios, Darkside is quite long since each scenario has several more stages when compared to Umbrella Chronicles. The Resident Evil 2 scenario stands out as being the most faithful to the actual game out of both Chronicles games to me. Darkside has one extra scenario and it still has plenty of files that can be collected in its environments. All weapons can still be upgraded through the use of gold found in the environments. Darkside allows a player to upgrade the default handgun, which can help out greatly for later stages. Darkside Chronicles is a lot less forgiving than Umbrella Chronicles in terms of difficulty. While this is good for overall challenge, it also makes it more frustrating with its flaws. The main problem with Darkside is that it has a very shaky camera throughout all of its gameplay. The camera shakes as the characters run or do any type of movement. Even though the shaky camera does add to the overall realism of the game and looks quite nice when viewing it, while playing the game, the shaky camera will mess up your aim quite often. The camera was bad enough on the Wii version with a motion controller, but with a PS3 controller, Darkside is nearly unplayable in a lot of sections without a Move. When a player goes to reload, the cursor on the screen disappears and this really messes up my aiming with a PS3 controller. The on-screen targeting cursor also blurs a lot with quick movements, which makes it even harder to keep track of with a PS3 controller. With a motion controller, these flaws are not even noticeable since you have an idea of where the cursor is when you finally stop it or get done reloading. RE: Chronicles HD Collection gives a player the ultimate version of Umbrella Chronicles and Darkside Chronicles, but you need to have a PS Move to fully enjoy them. They are playable with the PS3 controller, but the cursor cannot move fast enough at times to shoot all on-screen enemies as they attack. Umbrella Chronicles is more forgiving when using a PS3 controller since the camera does not shake that much at all and the overall action is slower. Darkside can be a catastrophe with a PS3 controller. Darkside can even be bad with motion controls because of its shaky camera. Both games offer some nice shooter gameplay with many extras for an RE fan however. With a PS Move, I'd highly recommend both, but without one, I'd recommend buying them on the Wii to play them with the Wii controller. Final Rating: 80%. Resident Evil Chronicles HD Collection has a full summary of all the older Resident Evil titles with on-rails shooter gameplay, but you need a PS Move to get the most out of it.